Product Use : Clear eyes ACR is a triple action formula that relieves itching, removes redness and soothes and moisturizes. 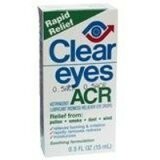 Clear Eyes ACR is a triple action formula that relieves itching, removes redness and soothes and moisturizes. Therefore it is indicated for the temporary relief of redness due to minor eye irritation and for protection against further irritation or dryness of the eye. Instil 1 or 2 drops in the affected eye(s) up to 4 times daily. If you experience eye pain, changes in vision, continued redness or irritation of the eye, or if the condition worsens or persists for more than 72 hours, discontinue use and consult a doctor. If you have glaucoma do not use this product excecp under the advice and supervision of a doctor. Do not use whilst wearing contact lenses.